Like the sweaty, fat person on the evening commute bus who plops himself down and takes over the arm rest, the thirteenth of August has arrived in typical fashion: hot and humid. 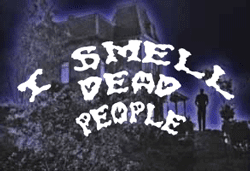 As always, we have no choice but to tuck in our elbows, breathe through our mouth, and type up the compilation of gruesome olfactory incidents that is FirstNerve’s most popular recurring feature: I Smell Dead People. Is your spouse busy? Are the kids all playing Xbox? Good. Then you can relax and savor this month’s edition. The man found dead inside a van parked in Portland’s Old Town area on August 6 died of natural causes, police said.
. . . A passer-by alerted police just after 6 p.m., after noticing a foul odor coming from the vehicle, according to Lt. Robert King with the Portland Police Bureau. Two bodies were found in Everett, Washington. The Everett Police Department is investigating two suspicious deaths discovered at a local apartment complex. On Monday August 6 just before noon Everett Police officers were dispatched to 9009 West Mall Drive to check on the welfare of the occupants of an apartment after a call was made to 911 by neighbors reporting foul odors emanating from inside the unit. When officers went inside they found two bodies. Tuesday afternoon the Snohomish County Medical Examiner’s Office identified the deceased as 50-year old Sandra L. Williams of Everett, and her 25 year old son Spencer L. Williams. The manager of a Gresham storage facility made a grisly discovery over the weekend. Police said he found a woman’s body inside one of the units. Officers responded to Money Saver Mini Storage at 19215 NE Halsey after the manager opened a storage unit because a foul odor was coming from the area. Swearingen, who was facing charges of methamphetamine possession and delivery from a February arrest, was supposed to appear in Multnomah County Circuit Court last Tuesday. Her trial was scheduled to begin the following day. But when she did not show up, a judge issued a warrant for her arrest for failure to appear, according to court records. Swearingen also faced charges of unlawful possession of a firearm and tampering with physical evidence in connection with an arrest last May. In relatively short order, Gresham police arrested the 56-year-old Portland man who had rented the storage unit. He’s been charged with her murder. The man police suspect of killing his 26-year-old girlfriend and stuffing her body in a storage bin at the Tower Boulevard apartment complex where they live was arrested Thursday in Lexington, Ky.
Lorain police Lt. Mark Carpentiere said Albert Fine, 30, was taken into custody without incident by Lorain police officers and members of the Northern Ohio Violent Fugitive Task Force, who had traveled south after receiving information about Fine’s whereabouts.
. . . Fine will be extradited back to Ohio to face charges in connection with the death of Catherine “Kat” Hoholski, Carpentiere said. A court hearing will likely take place in Kentucky today, he said.
. . . Hoholski’s body was found with the help of a cadaver dog after weeks of complaints about an odor at the Villas of Beau Monde apartment complex, according to Lorain County Coroner Dr. Stephen Evans. Weeks of complaints? Oh, man. National Park Service rangers in Nevada discovered a decomposed body in a houseboat on Lake Mead. Authorities said a suspicious vehicle and a foul odor led to the discovery of a body in a houseboat at Lake Mead Friday. Rangers with the National Park Service said the body was located just off Northshore Road near Mile Marker 8.
. . . Rangers were led to the body after a call reporting a suspicious vehicle with a foul odor. When authorities arrived, they found the body in the houseboat. Meanwhile, in Cranston, Rhode Island, a dead woman was found inside a garage. Police said the body was found around 8:19 p.m. last night in a two-car garage after neighbors complained of a foul odor. Residents in the area expressed shock in response to the incident and said people who currently live in one of the apartments in the house were outside on the steps grilling the other night while police guarded the crime scene on the curb. Richard, a neighbor who asked we not publish his last name, said today that he was troubled to hear about the young woman’s body being found. He has lived in the area for 35 years and things have changed in the neighborhood, he said. “Most of us try to keep things up around here,” he said as he swept the curb in front of his property. At the house where the body was found, he said, things have gone downhill. People who grill despite the stench of death, that’s who. The victim was eventually identified as a 20-year-old woman formerly from Dorchester, Massachusetts. Evangelist Nathaniel B. Nicks was cutting the grass in the front yard of his church when he says he smelled a strong, foul odor coming from across the road. Nicks followed the odor and found a dead body on the edge of the woods near the church Saturday afternoon. Bibb County Coroner Leon Jones says a badly decomposed body was found after 6:00 p.m. Saturday, when a neighbor smelled a foul odor coming from a home on the 4300 block of Houston Avenue. Jones says this is the second case recently of a badly decomposed body being found in the area, and people should make sure to check up on their neighbors. An unidentified woman’s body with nearly two dozen stab wounds was found in the attic of a home on the service road of the Van Wyck Expressway in Richmond Hill last weekend. Police were responding to a call of a foul odor . . . they discovered the body wrapped in plastic in a container in the attic of the home. According to police, the house was the same one where a 32-year-old man committed suicide on July 20. An NYPD source said the call about the foul odor that led cops to the body was made by the brother of the suicide victim who had gone to the house to collect the deceased man’s belongings. Linda Lou Chase, 72, of Lansing, Michigan is the latest nominee, from an incident that is already being referred to as the Case of the Mummified Boyfriend. A woman who kept the mummified remains of her boyfriend in her home for more than a year now faces criminal charges. Linda Lou Chase faces multiple counts of forgery, according to the Jackson County prosecutor’s office. Police and prosecutors say Chase collected and kept at least $28,000 in social security and pension checks meant for Charles Zigler. Investigators say he apparently died of natural causes—but that she kept his body in the home they shared for some 19 months. Police discovered the body after Zigler’s relatives got suspicious. Zigler’s body was found sitting in a chair in the house. Explaining her reasoning for keeping Mr Zigler’s body, Chase previously said she did it to have a partner for watching NASCAR races on TV with. ‘It’s not that I’m heartless . . . I didn’t want to be alone. He was the only guy who was ever nice to me,’ Ms Chase said. Yeah, don’t try to make it weird or anything. 10:51 a.m. Assisted the fire department with gaining entry into an apartment after a foul odor was reported. The odor was attributed to cooked peppers. Dude, you gonna eat that? 9:56 p.m. A caller reported youths toilet-papering cars. Until next time we leave you with a Zen-like exit question: Do dead bodies in Detroit stink if there is no one left to smell them? The article just spells out some grizzly and bizarre happenings like deaths in apartments and the like. But there is one incident in my area, in one of the self storage facilities. A man who was said to have accessed his self storage unit suffered a heart attack. No one noticed it since the unit was closed. Only when the lady at the counter thought one security key was missing, but she had the hunch that there might be something wrong. It was a day later that they found the man dead.